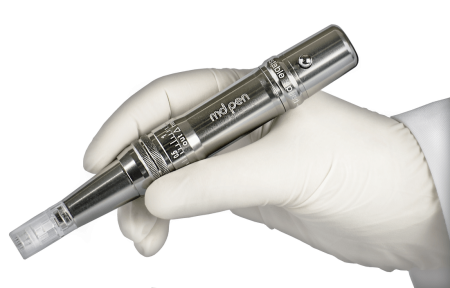 Skin rejuvenation treatments with MDPen micro needling can be used to lift	and tighten while diminishing wrinkles, photo aging, and pore size. Micro	skin needling can also be effective in the treatment of stretch marks	and acne scars. 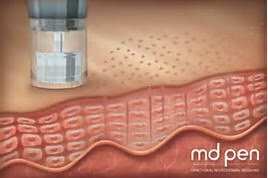 MDPen rapidly creates a pattern of micro channels in the treatment area. These micro channels significantly increase the production of collagen	and elastin to leave the skin smoother, fresher, and more uniform. 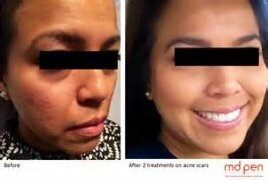 Micro	channels also enhance the skin’s ability to absorb medical grade topicals,	like anti-aging serums and skin lighteners, when applied during or immediately	after the treatment.